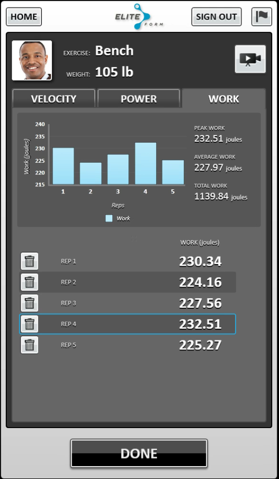 EliteForm PowerTrackers now display rep-by-rep work at the rack. Shown in Joules, the Work Tab appears next to the current Velocity and Power Tabs in both the Exercise and Lift Summary screens. By selecting the Work Tab, athletes and coaches can review the concentric work performed through every rep.
Work at the rack compliments the current Work Reports in the StrengthPlanner software. These reports aggregate concentric work performed by all tracked reps throughout the workout to allow coaches to monitor overall Workload over a session, cycle, and season.